Every year, crab pots and other fishing gear are lost in our sounds. The federation and local partners work every year to remove these pots, which are hazardous to boats and marine life. Since 2014, the federation has led the Lost Fishing Gear Recovery Project in an effort to remove lost crab pots from North Carolina sounds. Pots can become lost in a variety of ways, including large weather events. With the help of various partners, commercial fishermen are hired to collect the pots during the no-potting period, typically between Jan. 15 and Feb. 7. This program, which began northeastern North Carolina waters and has since expanded statewide, improves fish habitat and water quality and supports the coastal economy. The expansion of the program enabled the federation to hire greater numbers of commercial fishermen to collect a greater number of lost pots. This project is funded by the North Carolina General Assembly, with support from the National Oceanic and Atmospheric Administration Marine Debris Program. Learn more about the history of the program below. Video by The Outer Banks Voice. Taken during the 2018 statewide cleanup. A total of 78 commercial watermen and women worked in January 2019 to remove 3,112 crab pots from the North Carolina coast. The Lost Fishing Gear Recovery Project, is part of a statewide marine debris removal effort led by the North Carolina Coastal Federation with $100,000 from the North Carolina General Assembly. The project takes place during the no-potting period when all crab pots must be removed from the water due to fishing regulations. This cleanup was conducted in all three Marine Patrol districts — covering all internal coastal waters. In Marine Patrol District 1, which covers the northeast region of the coast, 24 boats made up of 48 commercial watermen picked up 1,714 crab pots. In Marine Patrol District 2, which covers the central region of the coast, eight boats made up of 16 commercial watermen picked up 1,159 crab pots. In Marine Patrol District 3, which covers the southeast region of the coast, seven boats made up of 14 commercial watermen picked up 239 crab pots. Chart of number of pots collected by year. The highlighted sections note the Lost Fishing Gear Recovery Project, which was only in District 1 from 2014 to 2016. Click to expand. This statewide project continued to serve all marine patrol districts in 2018 thanks to another $100,000 in state funding for the project. A total of 76 commercial watermen worked throughout the coast of North Carolina in January 2018 to collect 3,496 lost crab pots. The project lasted from Jan. 17-27, with boats working anywhere from two to six days, depending on the Marine Patrol district. In Marine Patrol District 1, which covers the northeast region of the coast, 24 boats made up of 48 commercial watermen picked up 2,245 crab pots. In Marine Patrol District 2, which covers the central region of the coast, eight boats made up of 16 commercial watermen picked up 1,004 crab pots. In Marine Patrol District 3, which covers the southeast region of the coast, six boats made up of 12 commercial watermen picked up 247 crab pots. In the summer of 2016, the North Carolina Assembly appropriated $100,000 to this project to facilitate a statewide expansion and hire greater numbers of commercial fishermen starting in January 2017. The funding was administered by N.C. Sea Grant and the 2017 project was a huge success. This additional funding enabled the federation to hire 72 commercial watermen, who spread out along the coast to collect 4,304 crab pots — more than the three previous years combined. Photo by Chris Hannant Photography. In 2013, the federation received funding from the NOAA Marine Debris Program and North Carolina Sea Grant to galvanize a partnership with local commercial fishermen, the North Carolina Marine Patrol, local nonprofits, scientists and community volunteers to collect marine debris in northeastern North Carolina. The federation then upcycled these recovered pots to build oyster reef habitats at three locations around Roanoke Island. From 2014-2016, the federation and partners conducted this project only in the first marine patrol district, or northeastern North Carolina waters. 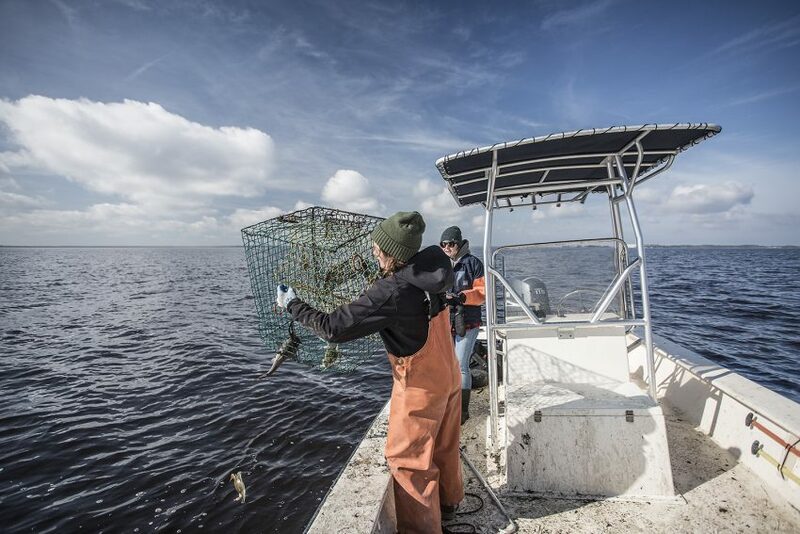 Over the three years, 41 total fishermen were employed in the following areas: Albemarle, Croatan, Currituck, Pamlico and Roanoke Sounds; Alligator River; Bulls and Kitty Hawk Bay. With additional funding from the NOAA Marine Debris Program in 2015, the federation was able to continue the project in northeastern North Carolina waters and was able to purchase new side-scan sonars and data collection tablets. In 2014 and 2015, the federation tested a new restoration technique — using recycled crab pots to create oyster reefs. The pots that were in good condition, yet unidentifiable, were upcycled to create the oyster reefs. A multi-faceted process, the pots are cleaned and all entryways are closed to prevent possible bycatch. The pots are then coated in a pH-balanced mortar that serves to both add weight to the pots while providing substrate for baby oysters (called spat) to land on. This “upcycling” was completed by several groups of college spring break students. The federation worked with the North Carolina Division of Coastal Management and additional commenting agencies to secure the needed permits for recycled crab pot deployment. The pots were deployed as oyster reef at three sites around Roanoke Island in the summer of 2015. A total 150 pots were recycled to create artificial oyster reef habitat. Similar work has been done with remarkable success in Virginia and South Carolina. Further, Dr. Niels Lindquist and Joel Fodrie of UNC Institute of Marine Sciences have experimented with upcycled pots near Morehead City.